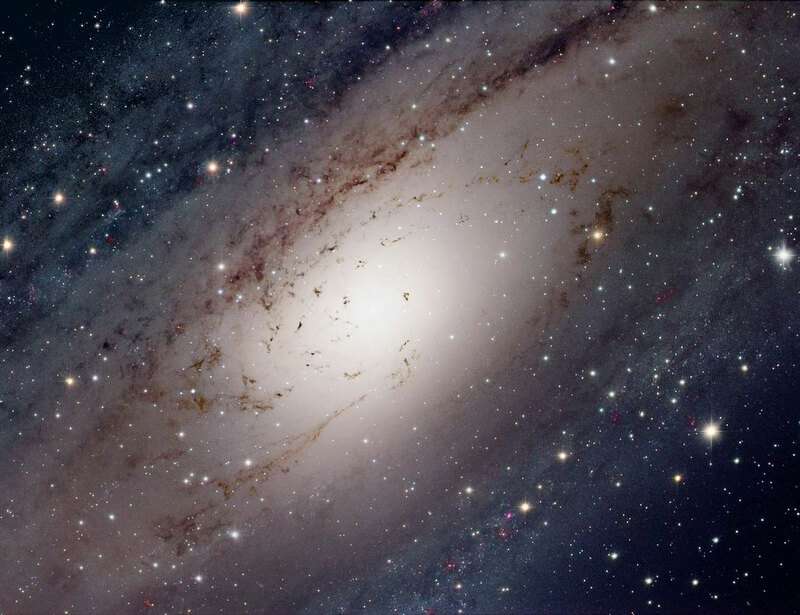 The center of the Andromeda galaxy is beautiful but strange. Andromeda, indexed as M31, is so close to our own Milky Way Galaxy that it gives a unique perspective into galaxy composition by allowing us to see into its core. Billions of stars swarm around a center that has two nuclei and likely houses a supermassive black hole over 5 million times the mass of our Sun. M31 is about two million light years away and visible with the unaided eye towards the constellation of Andromeda, the princess. 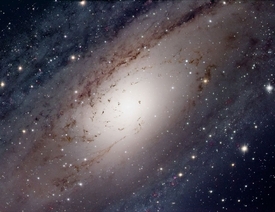 Pictured above, dark knots of dust are seen superposed on the inner 10,000 light years of M31's core. The brighter stars are foreground stars located in our Milky Way Galaxy. Selected NASA's Astronomy Picture the Day for December 27, 2004.